Lots of iPhone users know ( and of course many others don’t know) that iPhone does not allow users to save their contact lists on their SIM card for impelling users back up their iPhone with Apple’s another desktop tool - iTunes. But the annoying truth is that users cannot read the contacts in their iTunes backup and if they need their contacts in iTunes backup, they have to restore the whole backup, which is not grateful for users in most cases. And how to get contacts from iPhone to keep them safe without iTunes backup? You don’t have to worry about this question. The article will offer three ways on how to get contacts off iPhone. To get started, head to iPhone “Settings” and tap on “iCloud”. Toggle “Contacts” setting to “On” and tap the “Merge” option. Next, go to iCloud and log in with your iCloud account details. Click on the “Contacts” icon. When your contacts list open, click on the gear icon on the bottom left corner, choose “Select All” and then click on "Export vCard”. Save the vCard file on to your computer and you get iPhone contacts now. I often use this way to save my iPhone contacts. The advantage is that it is totally for free. But sometimes it met the vCard downloading issue due to the bad network speed. From the iPhone, go to “Settings” > “iCloud” and ensure that you are signed out of iCloud. If you are signed on, the option to sign out is at the bottom of the page. Connect your iPhone to computer. iTunes should open automatically. If not, launch iTunes from “Start” > “All Apps” > “iTunes” > “iTunes”. Click the icon for your iPhone located on the upper left corner of the interface. And select the “Info” option in the left pane. Check the items you wish to sync, then select what you would like to sync with. 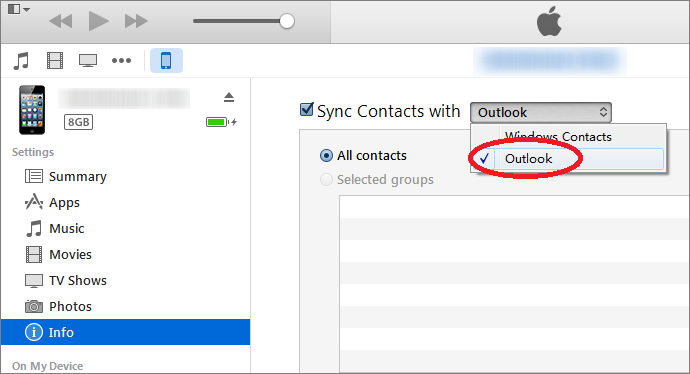 Here our path is to check “Sync Contacts with” > “Outlook”. And now you have synced your contacts into Microsoft Outlook. And the ways is also free but I know that it bothers some users who hate use iTunes. And that’s why we also offer the third way. If you are looking for a way to get contacts from iPhone to PC/Mac with high success rate and without iTunes syncing, iMyfone D-Back iPhone data transfer for Mac and iMyfone D-Back iPhone data transfer for Windows are what you exactly need. The program works professionally on transfer your iPhone contacts onto your PC or Mac. Why We Choose iMyfone D-Back? Get contacts from iPhone memory to a file on computer for future use. 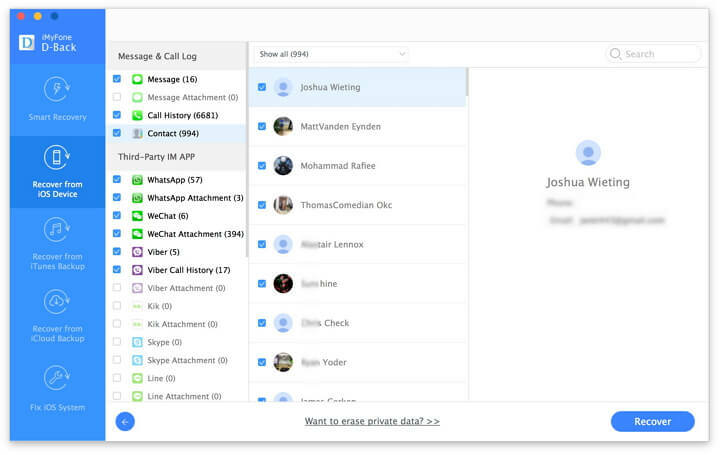 Save contacts with only one click, which will certainly save lots of time. Transfer 20+ types of iPhone data such as contact, message, photo, etc. Besides saving contacts, also help you find back your lost iPhone files. Support almost all the models of Apple iPhone/iPad/iPod Touch series. Free trial version is offered to figure out whether it is useful for you. Understandable and easy interface suitable for even computer illiterate. How to get iPhone contacts to computer with iMyfone D-Back? Run iMyfone D-Back and click “Start” from “Recover from iOS Device”. Check “Contact” and click Next to connect your iPhone. Click on “Scan” and iMyfone D-Back will get iPhone contacts, including the deleted ones and list them for your preview. You can see the contact numbers and emails if you add. After you preview all the contacts, you can select all or partial contacts and click on “Recover” button to choose one folder to get contacts from iPhone to computer. And that’s how to get contacts off iPhone with iMyfone D-Back for Mac or iMyfone D-Back for Win. It avoid the disadvantages of the former two ways and complete the transfer process without any hassle. You can try all the three ways without any payment for the former two ways are free and the last one offers free trial version for both Mac and Windows users. And if you have any suggestion for this article, leaving a comment will be welcome.